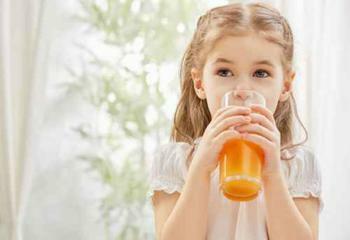 Its name may hint at the presence of a healthful component, but fruit juice is often anything but healthy -- and it shouldn’t be included in the diet of children under age 1, experts argue. According to a new policy statement issued by the American Academy of Pediatrics (AAP), fruit juice offers “no nutritional benefit” to tots who haven’t yet celebrated their first birthday. Sugary fruit juice contributes to the rising rates of obesity and concerns about dental health, the AAP contends in its statement -- the first revision to its stance on fruit juice since 2001. Per the new recommendations, children older than 1 year can consume 100% fruit juice as part of a well-balanced diet. However, the amount a child consumes should be limited based on his or her age. Toddlers. Parents and caregivers should restrict fruit juice intake to 4 ounces daily (at most) for toddlers age 1-3. Additionally, toddlers shouldn’t be given juice from bottles or “sippy cups.” The group argues that doing so could lead to tooth decay. Age 4-6. Limit fruit juice intake to 4-6 ounces daily. Ages 7-18. Limit fruit juice intake to 8 ounces or 1 cup of the recommended 2 to 2 ½ cups of fruit servings per day. Previously, the Academy advised against offering fruit juice to children under the age of 6 months. Now, the group says children shouldn’t have fruit juice at all during their entire first year of life. A separate report, “The First 1,000 Days: Nourishing America’s Future,” suggests nutrition during the 1,000 days between a child’s conception and their second birthday plays a huge role in their overall brain and physical development. The report found that at least 40% of parents introduce sugary drinks to their children too early. The AAP says children should be encouraged to eat whole fruits and be educated about the benefits of fruit as compared with juice, which lacks fiber and may contribute to excessive weight gain. The full statement has been published online in the journal Pediatrics.